We have analyzed more than 500,000 games from Club 12's all the way up to College teams. We've found the key stats that correlate most to winning or losing at each level of play. 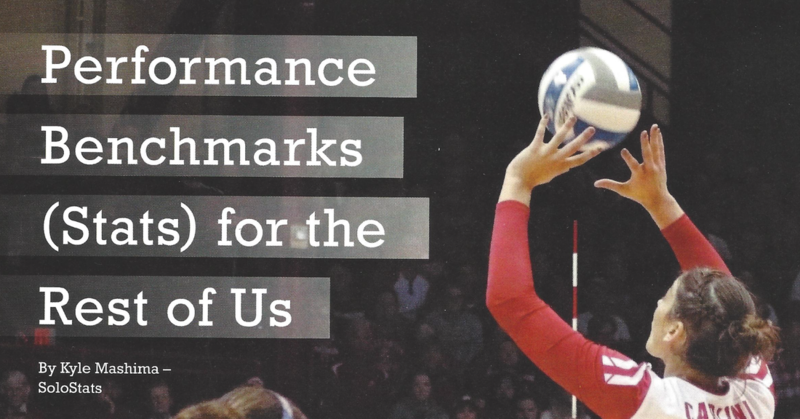 We presented our findings at the 2016 AVCA Convention in Columbus. Click below to see the presentation. Below are the slides for the video above. Now see where YOUR TEAM stands just by going to WebReports. Select your team and click Benchmarks on the Matches page. 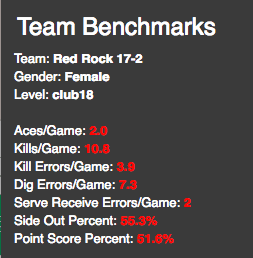 Below is a small sample of Performance Benchmark for a Club 18s team in WebReports. Shows team's ranking against national stats by Skill and predicted Win Rate. Know where you stand early in your season and improve the skills that matter to help you accelerate your Win Rate.